BMW is serious about the off-road chops of the new, huge X7 SUV, even if those abilities may never matter to the typical large-luxury-SUV buyer. The brand has talked at length about the various capabilities and systems that help the X7 when it’s off the beaten path. There is even an optional Off-Road package that consists of skid plates, an electronically controlled rear differential, and a handful of special off-road driving modes. 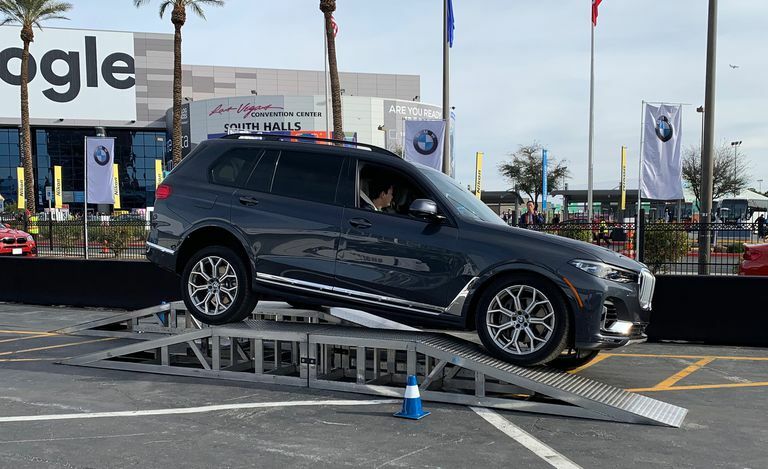 Instead of just letting us take their word for it, BMW set up a pseudo off-road course in a parking lot outside CES in Las Vegas, where we rode along while a professional driver showed off what the X7 can do. 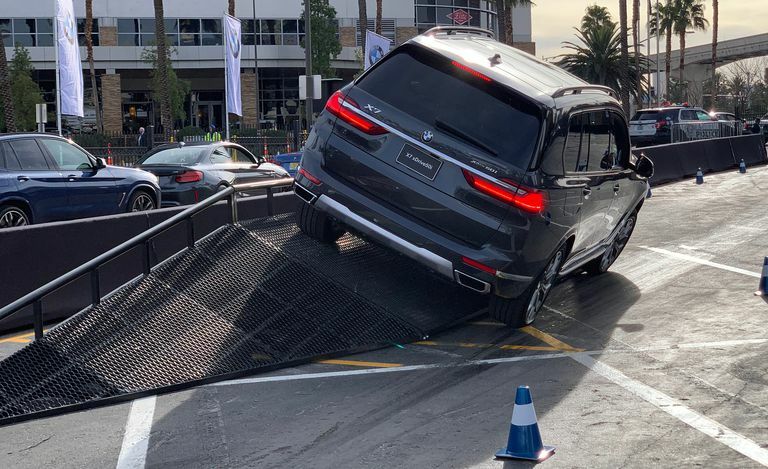 The first part of the course has the X7 drive over two staggered ramps, which showed off the suspension’s articulation capabilities. 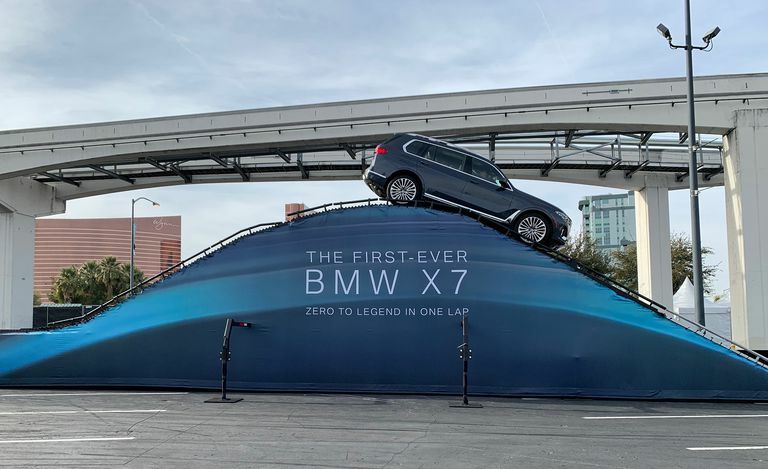 At one point, with four people in the vehicle, the driver was able to perfectly balance the X7 on two wheels—the right front and left rear—while the other two were completely off the ground. The X7’s front-facing camera can display images on the central infotainment screen to help with the positioning of the front wheels. Next up was a steeply angled ramp that had the X7 leaning far over to one side. 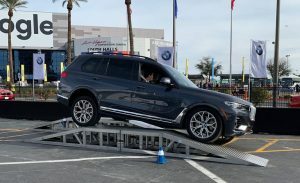 The driver boasted about how, even in an scenario like this, the doors are easy to open and don’t flex at all, which BMW’s driver said is an issue that other SUVs can suffer from. Leaning so far over in a vehicle while remaining stable is an eerie sensation, and the X7’s seatbelts automatically tightened as if it was going around a tight turn. And speaking of eerie sensations, the final portion of the course was a massive, hill-like ramp to show off the X7’s climbing and hill-descent abilities. On the climb up, metal rollers in the ramp made it so there was only ever one wheel that had traction at any given point, but the X7 still easily made it to the top. The central iDrive screen can display an image of the X7 with information on elevation, the angle of the surface the vehicle is on, and more; on the initial descent from the ramp, it showed an indicated 25-degree angle. A hill-hold system will keep the X7 in place on even the most steep slopes for two seconds after the driver releases the brake, easing nerves when proceeding from a stop while at such an angle. Nothing we experienced in the X7 was particularly groundbreaking, as there are many other luxury SUVs with real off-road cred, but experiencing situations like this in a huge $100,000 vehicle was fun and impressive nonetheless. This ride-along was also our first, if extremely brief, experience with a production-spec X7 outside an auto-show environment. The X7 we rode in was a top-of-the-line V-8–powered xDrive50i model with a two-tone blue-and-cream interior scheme. 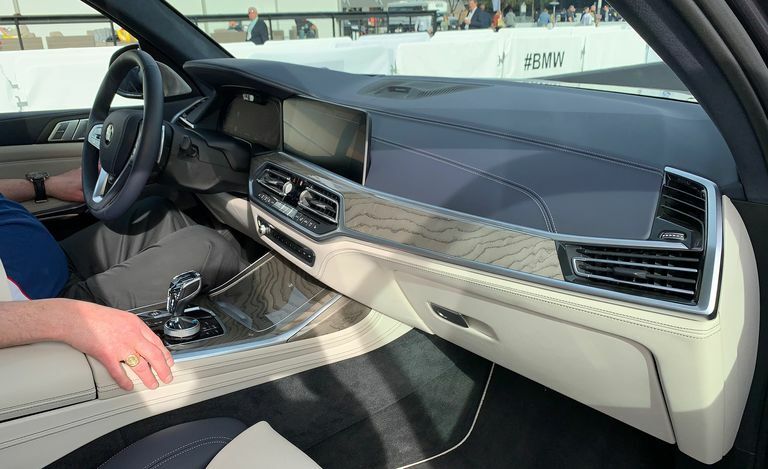 The materials were high quality and the design one of the best we’ve seen out of BMW in the past few years—as it should be, given the V-8 model’s $93,785 base price. We don’t expect to see many X7s at off-road parks and mountain trails once it goes on sale in March, but we are glad to see companies taking the SUV acronym more seriously.